The hubby and I are running our first 5K on Saturday. From what I can tell, it's a color run so it isn't as competitive as other races seem to be. So it will be a great first 5K especially since we are beginning runners. 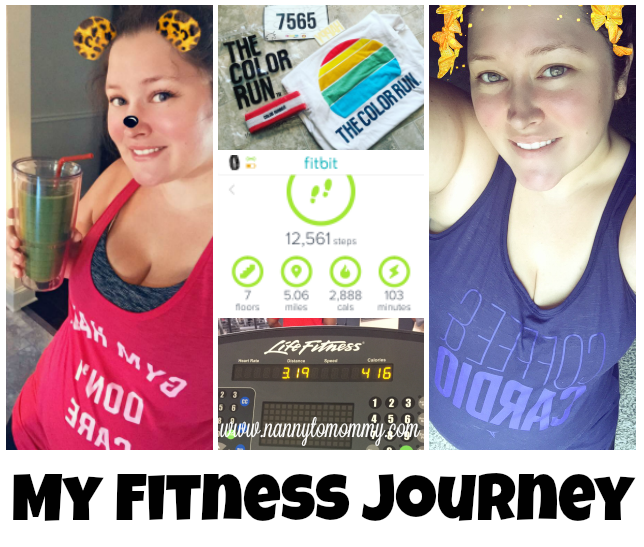 We have started a weight loss journey and healthy lifestyle to become a #FitFam (fitness family). We want to be healthy. And to get in the mind set, we have been streaming different documentaries to help us in our process. 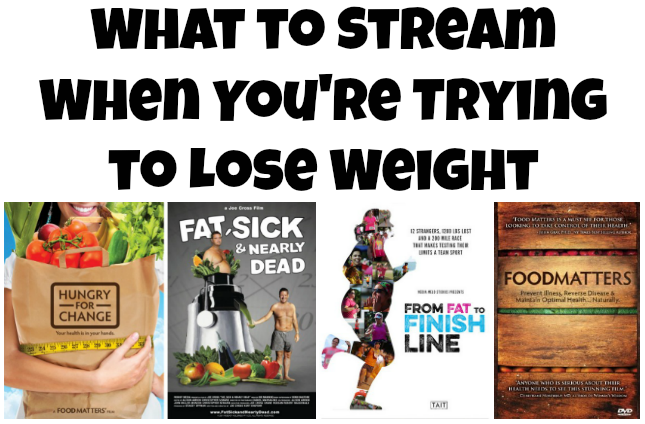 I have made a list of what to stream when you are trying to lose weight. Hungry for Change. "Thinking your making your own decisions about food? Think again. The food industry is doing it for you." A great source to teach you about why a diet lifestyle doesn't work, the importance of reading labels, and how a healthy lifestyle can benefit your body for more than just weight loss. I knew the power of veggies and kind of how to read labels, but this opened my eyes even further about the food I was consuming. Fat, Sick, & Nearly Dead. "Obesity and sickness have taken a toll. Two repentant men go on a crash course of vegetables to save their lives." I actually discovered this documentary because the main guy is featured in Hungry for Change. This one talked all about juicing. In fact he went on an all juice diet for 60 days. It is a little extreme, but when you have a disease you are willing to go to extreme measures. It made some great points. Both my husband and I have illness on both sides of our family history. We are hoping to change history and do better for our children. Food Matters. "Could modern medicine's 'cures' be the cause of what ails us? Healthy eating might just be what the doctor ordered." This film takes a timely and hard-hitting look at how the food we eat is helping or hurting our health, and what we can do to live (and eat) better. From Fat To Finish Line. It's about a group of strangers who have lost a TON of weight and they run a 200 mile race as a team. I really liked this one because one of the featured people is a blogger. I also like how it focuses on the importance of physical activity. If you are on a computer, you can search in Netflix for shows to add to your list based on search terms like "work out", "weight loss", etc. I want to update you all soon on our progress too. We haven't been very good about taking progress pictures before now, but I am making more of an effort to do that now. I also want to write a post about what we have been doing and eating. We haven't paid for a program or been buying any special pre-packaged foods. But I would love to share some of the recipes we have been enjoying. This time I haven't been starving myself and the weight has been coming off more gradually than really fast, but I'm hoping that I can keep the weight off this time. I do want to see that the scale really does mean nothing. I will talk about this in a later post. I have lost 20 pounds since January. Some may think that doesn't seem like much, but I can work out longer than I could before. I am sleeping better. My digestion is better. I have more energy. There are so many non-scale victories I have found as well. So that scale number means nothing. We are learning so much as we go. We grew up thinking one thing was healthy and now thanks to more research, we know differently. Documentaries and our own research have helped us greatly. I am so proud of the progress we have made and how we can improve from here. Are you trying to lose weight or get fit? What are some things you watch to help you learn more or get motivated? Im trying to get fit!! I am pretty thin but so weak and I hate it!! I will have to check these out!! Love our Netflix! I have been on a roller coaster with my weight ever since I had my last two kids and that was over three decades ago! Then I've been battling cancer, Hep C & now Diabetes! I was so skinny after the radiation, chemo & stem cell transplant. Now I am on meds that makes you gain weight!! I really don't like steroids either!! I'm between a rock and a hard place! I have like five different sizes of clothes! I could just cry! I am also on antidepressants. My doctors told me not to worry about my weîght - just be glad I am alive. I don't want to seem ungrateful! But like you mentioned, you feel better when you are healthier!! Good job and Kudos for you & your hubby for making the correct decisions on getting healthier!! Thank you! I know what you are saying, but sometimes I feel better when people say, you don't look sick or you are looking better! This lifts my spirits! It does help to get into shape with someone! I'm rooting for you both to stay healthy and may you meet all your goals!! I think most of us are all trying to lose a bit of weight and these are all super ideas to look into. I hadn't seen these! I need to check out a few of them. I've been trying to lose weight & done pretty well, but I need inspiration! Yes, I am trying to lose weight and get in shape. It's a hard battle. I will have to check these out on Netflix! Another good one is Morgan Sperlock's Super Size Me. It will put you off fast food forever. It is a good one and I almost added it to the list, but a lot of it is faked or exaggerated unfortunately. I do think the message of limiting junk food is a good one though. I think the important message not said is learning self control. Congratulations on your first 5K! I'm sure these shows were helpful! I still remember completing my first 5K. It's a big deal, Diana, so congrats!!! My husband and I love documentaries like this, so thank you for giving us some new ones to watch! How inspiring doing a 5K. I would love to do a 5K one day! I've been tying to get in shape myself. I've been doing a lot of walking including walking on my lunch hour. My goal is walking 10,000 steps 5 days a week. Good for you! I swim 3 times a week. I never thought about how important it actually is. This puts streaming into a better perspective, and it is important. I am trying so hard to lose weight and get so frustrated at myself. I like to watch the show My 600 pound life as they really do inspire me to never give up on myself. Great list! My must see list just got longer than my morning runs! Best of luck on the 5K! I dont have a streaming service, but I am sure these are available other ways. Good motivating movies. That is awesome! Keep up the good work. These shows sound like good ones. Thanks! Very informative shows. Too bad I don't have netflix. Can check them out at the library. forks over knives, cowspiracy are also great movies for inspiration. I will definitely share this with two members of my family who are trying to lose weight. Glad you are continuing on your journey to get fit.